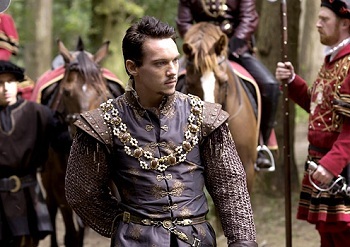 Jonathan Rhys Meyers, who played King Henry VIII in The Tudors, may be in talks to join the cast of Star Wars: Episode VII. While George Lucas already spilled the beans and revealed that the cast of the original Star Wars trilogy would be returning for Episode VII, there have been few details about who else will be in the film. Now, if rumors can be believed, the film may have gotten its first new cast member. Actor Jonathan Rhys-Meyers is reportedly up for an, as of yet, unknown role in the forthcoming Star Wars film. Meyers, who played King Henry VIII in the The Tudors and is set to take on the titular role of Dracula in the upcoming NBC series of the same name, has, according to the Latino Review, been in talks with Disney and Lucasfilm that could lead to his joining the film. The Latino Review was the publication that originally broke the news about Harrison Ford returning for the new movie. Meyers doesn't have a huge amount of experience in blockbuster or genre films like Star Wars, but he has worked with Episode VII director J.J. Abrams in the past during the filming of Mission Impossible III. As well, whatever Meyers might lack in blockbuster credentials, he can arguably make up for it with simple range. While The Tudors played host to some deep historical accuracies, it nonetheless boasted some diverse and excellent acting from multiple cast members, including Meyers. Meyers portrayal of King Henry VIII saw him travel through stages of the character's life colored by shades of cruelty, tenderness, lust, madness, and regret. In short, Star Wars: Episode VII could do worse. If Meyers does join the film the next big question, of course, will be who he's playing. Personally, I think he has a bit of a young Grand Moff Tarkin look to him and that he'd make a fantastic stodgy Imperial officer. As with all things regarding the new Star Wars films, we'll have to wait and see.